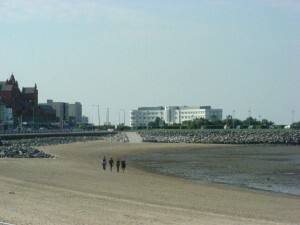 Morecambe is a fading, or probably now better to say faded, old seaside town on the Lancashire coast of northwest England – it seems required to say this to start off with, because even in the south of England a town like this is probably more remote than Machu Picchu or Marrakesh, or maybe just a place they’ve vaguely heard of but have no idea where it is. I lived there for a while years ago. 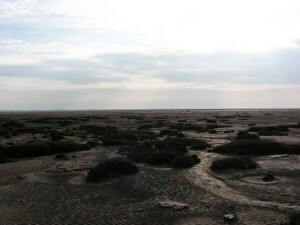 It sits on a vast bay, where at low tide the sea retreats 10 miles or more to leave vast empty swathes of sand, marsh and mud flats. 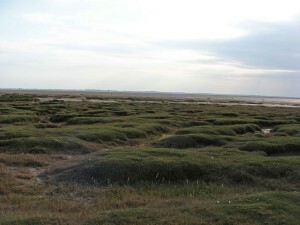 For some if they’ve heard of Morecambe Bay at all it might be linked with a tragedy, of a group of Chinese migrant workers sent out to pick cockles on the flats in 2004 without any knowledge of the bay – or even of English – and who were left out there unprotected to drown when the tide turned. 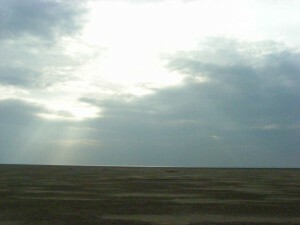 For Morecambe Bay to be associated with anything so atrocious and vicious is jarring, for normally Morecambe seems so monumentally peaceful. It always had certain limitations as a seaside spot, like the occasional blasting winds that even in bright sunlight feel as if they’re seriously out to knock you over. Whatever razzle-dazzle it ever had as a resort town is now scarce, only surviving in a few lights and gaudy shop-signs. Even in Morecambe’s heyday – from the 1880s, maybe, into the early 1960s – it was never that much, nothing like the show at brash and noisy Blackpool a short way further south. Now the end-of-the-pier show has definitely ended, gone with the pier, which in 1992 was like many other old British seaside piers knocked down before it fell down. Today Morecambe town seems to have given up any efforts to preserve its old rides-on-the-beach, cheap holiday past and gone for a more cultured appeal. The long, long, beachfront promenade has been renovated as a giant, playful art object, a string of sculptures that evoke not sugary rock and ice-cream but the Bay itself and its sea birds, of which there are thousands and thousands. And in the middle of the Prom the Midland Hotel, an elegant white art deco monolith that looks vaguely like something detached from an ocean liner and was built in 1933 in an attempt to send Morecambe upmarket, has been renovated as a positively chic style hotel. 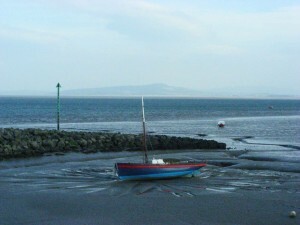 And what you can do in Morecambe is look at the sea. At the infinite expanse of vast horizontals, of sand or water or some vague indefinable mixture of the two, with the line of hills of the Lake District across the Bay shifting shape in the changing light. This is a very democratic pleasure. All along the Prom there are benches with little memorial plaques with inscriptions like, ‘For Grandad, who loved to sit on this spot to look at the sea’. 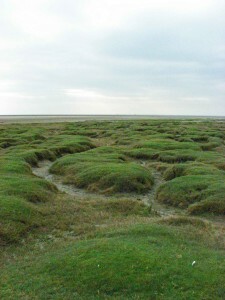 Largely unappreciated Morecambe Bay is one of the world’s great natural art objects. 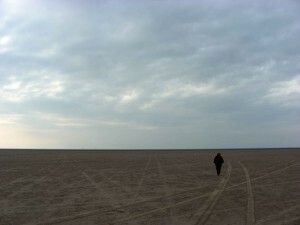 If you feel inclined to minimalism, to clear your head of clutter, go to Morecambe, for a sense of clean space, or simplicity of line, with more grandeur and completeness than you can experience from a thousand art installations in galleries. The sheer extent of the horizontals makes you feel more grounded in the earth. At the end of the land spit south of the town are Middleton Sands, where the sea goes out even further, and where as well as empty sands there’s an immense natural sculpture garden, of mud banks twisting in bizarre shapes between the eddies and strange turf-walruses basking, rearing and bending towards the sea, all beneath a vast cathedral sky. As background there’s just the wind and the eerie whistling of curlews. 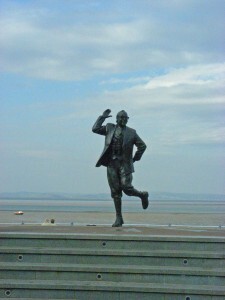 Plus, Morecambe has back on the prom its unmissable human sculpture, of Eric Morecambe himself.